Have you ever purchased a product based solely on its quality? Whether we’re thinking about purchasing the next iPhone or a new-release Nike sneaker, we often justify the purchase of an expensive item based on more than just quality — we also factor in our perception of the product and brand behind it. If you’ve ever found yourself with an expensive good that doesn’t measure up to your expectations, it’s likely it was priced using a prestige pricing strategy. This is a strategy where companies mark up the price of their product to create the perception that they’re selling a high-quality product. This pricing strategy is closely tied to brand perception. Companies that take this approach to pricing often have products that are recognized for their superior quality or the value they add to the lives of customers. The pricing method works based on the assumption that consumers perceive more value in the product if it’s priced high, and they’re willing to pay a higher price for it. Some high-profile companies use prestige pricing to value their products. Let’s take a look at examples of these businesses. Nike: With celebrity endorsers (e.g., Michael Jordan, Serena Williams, etc.) and its well-recognized logo, Nike prices its products based on its image. If high-profile athletes are wearing Nike, shouldn’t you? Rolex: Would you be willing to spend thousands of dollars on a watch? The perceived quality and luxury of a Rolex watch, and the status that comes with wearing one, are a few of the reasons why it’s a premium-priced product. A prestige pricing strategy is when companies deliberately set their prices higher than the actual cost of the product. Fashion, technology, and luxury goods are often priced with this method because they can be marketed as exclusive or rare. Commodity goods aren’t unique items and a prestige pricing strategy isn’t a good fit. 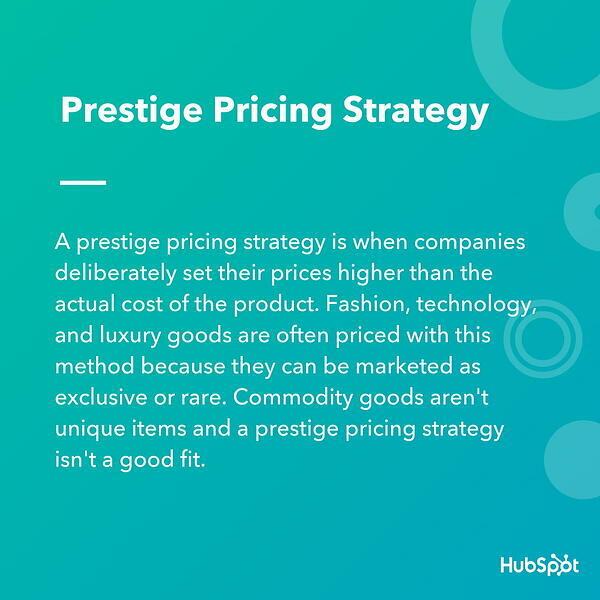 Prestige pricing strategies can vary depending on a company’s goals for their brand and offerings. You’ll want to look at competitors in your market to see how they price products that are similar to yours. With a unique value proposition that differentiates your product from the competition, you’ll be able to justify a higher price point. For example, it cost $288 to make the iPhone 8. With Apple’s prestige pricing strategy, the iPhone 8 was sold to consumers for $799. Apple priced the smartphone 177% above the production cost.